Loans, scholarships, financial aid - How to fund your studies? Financial aid - How to get funding for your College? Congratulations! You stand at the threshold of one of the most important and formative experiences of your lifetime: attending an institution of higher education. The process of getting into college is certainly more of a marathon than a sprint. The successes and failures of the past four years have all come to bear upon this moment. But whether you are still in the process of deciding where to apply or you are holding that coveted acceptance letter, your work isn’t finished; you need a plan for how you will pay for your education. Contrary to common misconception, there are scholarships for just about every student, regardless of background. The challenge, however, is finding those scholarship programs that are right for you. High school guidance counselors, local community organizations and businesses, and online searches are the best resources for finding free money for college. To increase your chances of receiving an award, you should submit applications for as many scholarships as you are eligible. Just remember that you are not alone in your quest for scholarship money; expect strong competition, especially for larger awards. In the quest for scholarship dollars, it’s best to go into the process with an open mind. Explore academic-based merit scholarships. Even if you didn’t finish at the top of your class, there is likely a scholarship program out there for you - especially if you are the first in your family to attend college or if you plan to attend a trade school. Research non-academic scholarships. Sure, there are plenty of scholarships for the talented athletes among us. But take time to find scholarship programs that reward students for other extracurricular endeavors such as community service, religious affiliation, excellence in the fine arts, or membership in national youth organizations. Embrace your unique individuality. Most students are familiar with scholarship programs geared toward minorities and women, but the list of scholarships that celebrate individuality doesn’t stop there. Whether it’s a scholarship for left-handed students or this $10,000 grand prize for creating the best greeting card, you’re sure to find a program made just for you. Federal Work-Study (FWS): This federal program provides part-time work experience for students in need of financial assistance. Currently, over 3,400 institutions of higher education participate in FWS. Eligible students join the work-study program offered by their college or university and are placed in employment opportunities that match their course of study. This gives students the opportunity to earn money towards tuition and other living expenses while acquiring experience that will help them land a job after graduation. Pell-Grants: Some students may be eligible to receive federal financial assistance in the form of a Pell Grant. Unlike traditional student loans, federal Pell Grants do not need to be repaid. To be eligible, the student must be U.S. citizens with a high school diploma or GED, must not have already earned a bachelor’s degree, and must demonstrate financial need. The amount of money a student could potentially receive is capped at $6,095 for the 2018-19 school year, but you may receive less based on the government’s determination of your needs. Pell Grants are administered by your institution of higher education, and you must reapply every school year. Loans: Money offered through a loan program must be repaid with interest after graduation. These loans are issued by banks and guaranteed by the federal government. 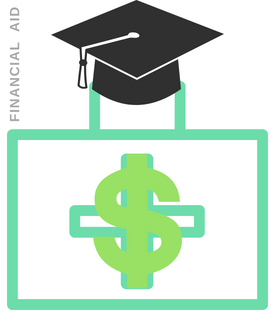 Often these loans are issued to both the student and their parent(s) if the student is still considered a dependent. Funds from your loans are distributed on a regular basis directly to your place of higher education. In many cases, these loans cover tuition, books, and fees, as well as living expenses. Because all loan money must be repaid, taking on student loan debt is a very personal decision. The pros and cons must be weighed against all other options for financing your education. Since 1916, the Reserve Officer Training Corps (ROTC) has been preparing young adults to become the next generation of military officers. Over 1,700 college and university campuses in the U.S. have an ROTC program on campus. ROTC students receive up to four-years of free college education in exchange for a guaranteed commission in one of the five branches of the U.S. military (Army, Navy, Marines, Air Force, or Coast Guard). At various times throughout the school year, ROTC students attend leadership classes and receive specialized military training. After graduation, ROTC students are committed to serve as an officer in the military for up to four years. Officers who choose to complete 20 years of service receive outstanding retirement benefits, and many benefits offered to service members may be transferred to their dependents. (Did you know your military service could help pay for your children to go to college in the future?) Additionally, there is a high demand in the civilian workforce for individuals with military experience and training. Any U.S. citizen eligible for military service may apply, and acceptance rates are strong. You may be surprised to learn that the U.S. government manages the largest international exchange student program in the world. In 1946, the Fulbright Program was established to promote mutual understanding and respect among nations through the exchange of people, knowledge and skills. Every year, the U.S. sends Fulbright students and scholars to nearly 140 countries as unofficial cultural ambassadors. Administered by the State Department, these highly competitive grants are open for individuals pursuing coursework in a variety of subjects including fine arts, humanities, social sciences, mathematics, and science. Successful recipients of Fulbright scholarships and grants have strong academic records, demonstrated leadership potential, and a passion for cross-cultural experiences. Candidates must submit a compelling project proposal or statement of purpose, as well as a personal statement and three to four letters of recommendation as part of their application. As you can see, there are many creative ways to pay for your college experience. Coming up with the right financial strategy won’t happen overnight. The best plan will be a combination of options that work best for you and could take many months to develop fully. Don’t be discouraged if not everything comes together quickly or if you have to make adjustments along the way. Remember: if you stay the course, you will succeed!